Snow Trekking at Unryu Valley (雲竜渓谷スノートレッキング) is one of the most popular snow trekking at Nikko, Tochigi prefecture. 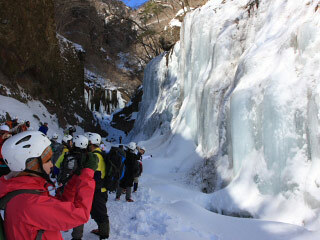 It is about 15km long trekking on the snow headding the Unryu Valley where has many giant icicles and frozen waterfalls. It is just like walking through the ice age. These snows icicles are good from the end of Janurary to middle of Februrary. Period: the end of January to the middle of Februrary. Unryu Valley is located on the eastern side of Mt. Nyohou. It has beautiful giant icicles and frozen waterfalls. The scenery of the Unryu Valley and the mid way is a excellent winter wonderland. Highly recommend to join a tour and never climb alone. You need a complete wear for winter clibming, snow spike and helmet. Never go under the icicle. It is very dangerous.